feipoa wrote: It would be interesting to benchmark it against AC's EISA system. I think his memory scores were more in the PCI-486 range. AC system is better, SIS chipset is faster than the OPTI one. Unfortunately I only got this Eisa board. Imho my system performances are acceptable only at 50mhz bus speed, at lower bus speeds it's not that great. I kind of wish I had kept my PET48PN a little longer. I never got a chance to try a Cyrix chip in it. I can tell you one way your board is superior is that it can work normally with a Cyrix 5x86 chip without any additional coaxing. On my two SiS boards, and a DTK Symphony 486 ISA board from the same era, the only way I can get the system to start is to jumper the Cyrix chip for "2.5X" mode which was originally meant for intel DX4s, but ended up just going to BREQ. That lets me boot in 2X mode. From there I have to use software to drop down to 1X, and then back up to 3X mode. If I try to set the chip directly to the 2X or 3X mode using the jumpers, I just get a black screen and no beeps. I'd really like to get to the bottom of that one day. Your board may also work better at 50MHz. I think the SiS is the way to go for 33 and 40MHz operation though. Overall, I think I still prefer running am5x86s at 160 in my boards. It just feels snappier than the Cyrix 5x86 at 120. Your L1 memory scores seem to be pretty much inline with mine. I think that's just normal when you can't put the cache in writeback mode. There are a few other EISA 486 chipsets I'd really like to try. One of them is the VIA chipset. As far as I know, it was developed by Symphony, but then they got bought out by VIA and it was renamed. I was pretty impressed with the performance of my Symphony ISA board, so the EISA one can only be better, right? Then there's that Intel EISA chipset. That one never comes with VLB slots though, and it's only good in the later revisions. The earlier ones are supposed to be buggy. This chipset is supposed to have the best 50MHz performance though. The Micronics EISA/VLB board I had featured a partial implementation of the later Intel EISA chipset. The board had odd limitations though, like you couldn't turn on BIOS shadowing if you had over 16MB of RAM installed. I think one of the best features of the PET48PN compared to SUPER EISA is the 2x 72 pins SIMM Sockets, 72 pins modules are a bit easier to find and cheaper than 30 pins high density modules. It also doesn't have a goddam leaking battery as most of 1992 motherboards have and it's in beautiful conditions. In the end I really like it and it is a nice acquisition. Since my Amd 5x86 ADW posts at 4x50 at default voltage I should try to overvolt it, maybe it can do 200mhz. Both my Quickchip 133 with qfp amd 5x86-P75 do not even post at that clock. There is also the 66mhz bus setting to mess with. While I'm impressed with the Miro trio32 which works at 50Mhz at 0WS. Regarding your overclocked ADW - I would start with getting it stable at 180 MHz before jumping to 200 MHz. If you were able to get it stable at 180 MHz, what voltage? Madowax wrote: I think one of the best features of the PET48PN compared to SUPER EISA is the 2x 72 pins SIMM Sockets, 72 pins modules are a bit easier to find and cheaper than 30 pins high density modules. It also doesn't have a goddam leaking battery as most of 1992 motherboards have and it's in beautiful conditions. In the end I really like it and it is a nice acquisition. Since my Amd 5x86 ADW posts at 4x50 at default voltage I should try to overvolt it, maybe it can do 200mhz. Both my Quickchip 133 with qfp amd 5x86-P75 do not even post at that clock. There is also the 66mhz bus setting to mess with. While I'm impressed with the Miro trio32 which works at 50Mhz at 0WS. The ADZ chip I tested did not react positively to higher voltage at 200mhz though. I'm really looking forward to your results! I almost had a B1 revision Am486 DX2 chip stable ta 180 MHz. It ran pretty well in DOS at around 3.8 V. It would crash in Windows though. I took it up to 4 V, but it wasn't enough. AT 5 V, it would not POST. feipoa wrote: I almost had a B1 revision Am486 DX2 chip stable ta 180 MHz. It ran pretty well in DOS at around 3.8 V. It would crash in Windows though. I took it up to 4 V, but it wasn't enough. AT 5 V, it would not POST. I will try it on the LS-486Es I got 1x rev.B, 1x rev.C1, 1x rev.D, as you know they got 4V setting without any mods and 60 Mhz/66 Mhz bus speed with 1/2 PCI divider. On the PET48PN at 50x4 it starts to boot but it crashes with corrupted charactes on screen just after "Starting MS-DOS..."
Same here. I tried 16BGC B1 stepping at 180. It actually boots into NT4 for a few minutes, but then crashes. I tried up to 4V. The LuckyStar LS486E is an ace board for more "extreme ventures". How did you solve it? I just added a Logitech bus mouse with ISA bus mouse card to my NexGen system (now my only system without PS/2). The tracking is incredibly smooth. My first impression was that it was better than PS/2. I'm using a Logitech MouseMan Deluxe-bus mouse model PK32. feipoa wrote: How did you solve it? I just added a Logitech bus mouse with ISA bus mouse card to my NexGen system (now my only system without PS/2). The tracking is incredibly smooth. My first impression was that it was better than PS/2. I'm using a Logitech MouseMan Deluxe-bus mouse model PK32. Logitech Bus mouse is a very cool solution, is it good then? I have never tested one. It's the Matze adapter on a UART ISA with some changes to the firmware of the ATTiny, still in test phase but working nicely. Nice! I like how the chips are socketed. Does it work with KVM's? That's the issue I had with Matze79's protocal converter. The issue with using a bus mouse card is that your mouse selection will be very limited. feipoa wrote: Nice! I like how the chips are socketed. Does it work with KVM's? That's the issue I had with Matze79's protocal converter. I made some firmware/hardware mods (nothing special) to reduce lag, I have tested it and it works fine with all my PS2 mouses up to 1280x1024 with no lag on my am386dx-40 in win 3.11, while before the mods there was no lag up to 1024*768 and a bit of it at 1280*1024, but I have no KVMs to test it. Is there a kit I can buy and assemble to test with my KVM? EDIT: Or can your firmware be adapted to the original Matze79 unit I already have? Both Amigas and Atari STs use what are basically bus mice. They likely work with a properly wired adapter. Even better, they make Amiga/ST bus mice to USB or PS/2 mice adapters to use modern optical mice. NJRoadfan wrote: they make Amiga/ST bus mice ... to PS/2 mice adapters to use modern optical mice. Here there are some pages about the classic PIC based adapter with schematics and firmware, you can build it yourself or find one assembled in any amiga commercial e-shop, most of them are based on this design. Basically Amiga mouse as you know use a standard db9, you have to replace that on the adapter with a mini-din9 and you have to connect db9 pins to the corresponding signal of the bus mouse mini din, after that the adapter should make almost any ps/2 mouse works with your bus mouse ISA card. 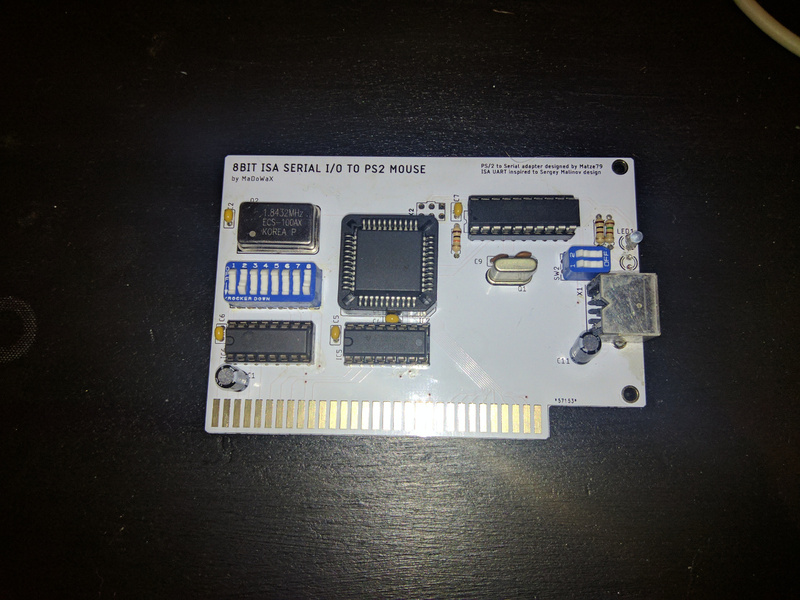 On the other end my ISA board doesn't come in kit but I can send you one assembled if you are willing to test it with your KVMs and let me know if it works. EDIT: it's also possible to replace the matze original adapter firmware with the edited version, but you also have to replace a couple of components on board, it's not the same but almost identical results. I actually don't know anything about Amiga systems and have never owned one. So Amiga's use a DB9 connector for a bus mouse? That's interesting - I thought bus and inport mice were mini-DIN9. Is there any hardware on your protocol converter board which needed to be altered to decrease the lag, or is the lag issue purely a software (firmware) alteration? If it is purely software, I wonder if you'd be able to send your firmware adapted for matze79's unit? Solving the lag issue with KVM's is of great interest to me, and I know others have commented as well that they KVM's showed horrific lag. Some KVM's seem to be OK though. If shipping is not too costly, I might be willing to test your adapter directly. Do you have a spare, or just the single unit? Has there been any thought to build a PS/2 mouse ISA card, as you have, but using a keyboard controller chip instead of doing a protocol conversion?